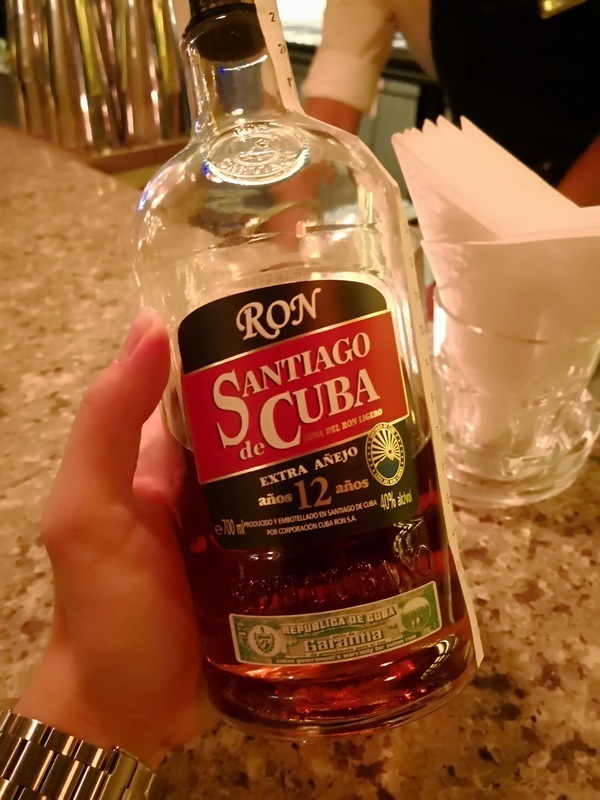 Have you found an online vendor selling Santiago de Cuba 12-Year? Smells like cherry cola with a hint of cinnamon. Some tobacco on the palate. Easily recommendable as a sipper. The best brand of rum from Cuba. Sharp not sweet but still really nice. Anejo - Extra Anejo - 11-years - 12-years - ... ze maken het een beetje ingewikkeld daar bij Santiago. Zou het daarom zijn dat Santiago Castro's favoriet was? Vergis je niet de Anejo is een 3-jarige rum, die zich goed leent tot het maken van eenvoudige cocktails, een goede mengrum voor weinig euro's. Hier staat dan ook geen cijfer op het etiket! Daar de 11-jarige vooral in Cuba vlotjes verkoop, wordt deze hier in Europa minder frequent aangeboden en durft men wel al eens een Anejo hiervoor laten doorgaan. Toch staat 11 duidelijk op het etiket (zie foto en mijn rating). De 12-years is de best verkochte Santiago in Europa en is voor mij een zeer toegankelijke rum. De aanzet is quasi volledig gelijklopend met de 11-jarige. Ook een lichte alcoholroes in de neus, maar zeker niet agressief. Bij het proeven is de amberkleurige iets ronder dan de 11-jarige en voelt iets vettiger aan. Zachte toetsen van caramel en vanille zijn duidelijk te onderscheiden, ook wat verbrande suiker en een houterig aroma komt even de kop opsteken. Maar verdwijnt al even snel als deze gekomen is. De afdronk is iets langer dan bij de 11-jarige, maar verder dan drie tellen kom je niet. Kortom geen slechte sipper, zeker niet te zoet, maar ik moet onnoemelijk hard mijn best doen om enkele verschillen te ontdekken met de 11-jarige. Zouden ze een marketing-loopje met ons genomen hebben? Of had Castro een iets betere binding met het nummer 11? Enjoyed this on the beaches Of Cuba from the ‘Meliá Las Antilles” top shelf rum selections. It pleasantly did the trick for holidays - but not sure it’s something I would stock at home. A very sweet profile with mahogany and cinnamon spices finishing the flavors. Mix with cola. It tastes more like a vegatable distillate i.e. made from beetroot sugar and not cane sugar. No caramel taste at all, no cask taste, strange that it has dark color. It is unusual but not bad at all. Have had both the 12 year and 11 year rum. The 11 year definitely rates higher, which I found strange as it beat a 12 year rum. Neither too smooth, nor too taste. Just a decent rum. 11 is a way better! The rum has full body with stronger alcoholic accent. Brandier one. A touch of raisins. Analizare mas detalladamente esta experiencia proximamente, pero no se puede explicar la sensacion tan embriagadora que experimente, un 10 !! Sampled this rum at the Santiago de Cuba stall at Cardiff Rum Festival. I would be inclined to rate this 12 year old an 8 but at £60+ a bottle its got to be a 7. The El Dorado 12 is much more affordable and better in my opinion. It's a good sipper nonetheless and definitely worth trying if you get the opportunity. It's rich, fruity and sweet on the nose. With a fruity flavour, with touches of caramel and nuts. Offers quite a bite, could not remember much else. Didn't think i would enjoy this as i was really underwhelmed by the Anejo , but it was a big improvement. darker in the bottle than in the glass . pours a nice amber colour .Unfortunately the only smell i could detect was from what i guess was added caramel colouring ? That said it was a nice light , dry and crisp type of rum. Not a sipper for me but another very good high quality mixer. 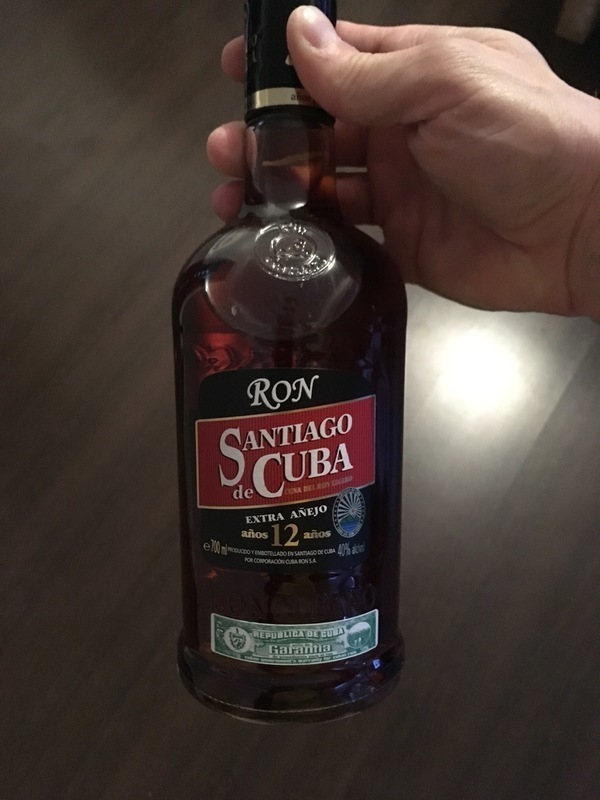 This sweet ron from Cuba has a great reputation and now i can confirm it. The bottle is made with the plastic cork that helps the cocktail makers. The color is deep brown and the taste sweet but not too long ; thats a regret. The final taste is homogeneous and There is no bad effect with volatile alcool. I recommend that rhum especially due to the rate price/qualité. Too much dry for myself. Very low complexity. Not comparable with other 12y rums. I wasn't expecting so much from this rum and the complexity of it. Well Cuban run which is good on its own. Rich candy floss with caramel and acidity of grapefruit peel. Floral notes of maple syrup and coffee bean yet with a touch of toasted wood which isn't overly sweet. Sweet baking spices, lightly oak and dry crispy crackers. It has fruitiness and tartness of plum/peach compote with red wine vinaigrette. Buttery, maple syrup, pear, red grapes banana finishing. Well balance liquid gold for a Cuban rum. Notes of caramel, vanilla, fruits. Smooth. Tastes a bit better than Cubaney Centenario. Let it rest for a while and it blooms. Fruity, smooth and nice, but still not top of the line.